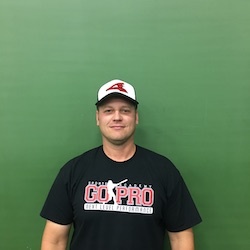 Jason is the owner of the Go Pro Sports Academy and Go Pro Baseball Organization. He has 9 years of professional baseball experience ranging from independent baseball to AA. He has been an instructor for over 10 years, working with ages ranging from 6 years old up to college athletes. Jason was an all-state high school player at Plainfield Central, and was drafted in the 40th round straight out of high school by the Pittsburgh Pirates in 1995 and again after his junior year in college in the 29th round by the Toronto Blue Jays. He played Division I baseball for Western Michigan and Northeast Louisiana, leading Northwest Louisiana with home runs and breaking the singe season RBI record as a senior in 1999. He player in the Cape Cod league in 1997 and signed as a free agent in 1999 as an infielder with the Pirates. He converted to a pitcher in 2000 and in 2002 he broke the single season strikeout record with 156 strike outs in the Frontier League. He was 2003 Baseball America's Independent Player of the Year. With the AA Brewers, Jason posted a 2.53 ERA with 54 strikeouts in 54 innings. Jason's overall statistics in AA are a 3.18 ERA with 82 strikeouts in 87 innings.